LEWISTON, Maine — It’s a cultural knockout that this mill city in Maine didn’t see coming: one of the nation’s first exhibitions showcasing artists from Saudi Arabia. And a central goal of “Phantom Punch: Contemporary Art from Saudi Arabia in Lewiston,” says one of its organizers, “is to promote cross-cultural understanding between the U.S. and the Arab Islamic world. 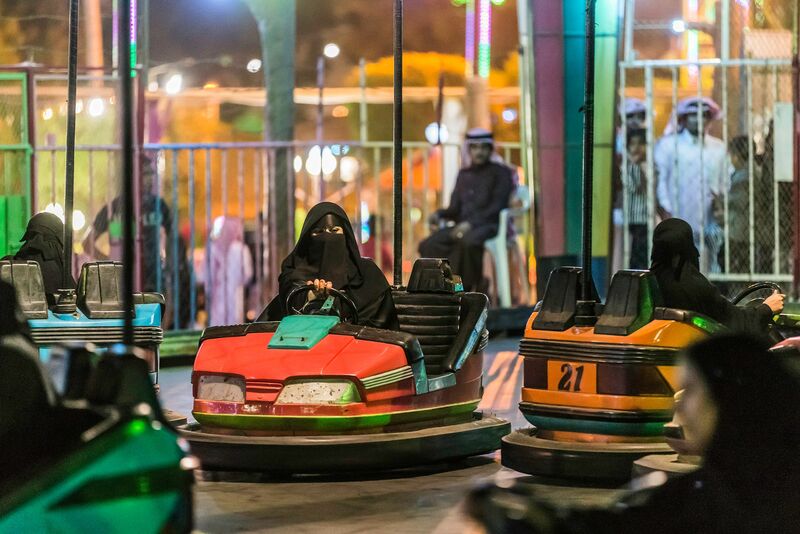 “We want to show that there are creative, interesting, critical people who are exploring the political and cultural issues in Saudi Arabian society,” says Loring Danforth, a professor of anthropology at Bates who co-curated the exhibition with museum director Dan Mills. Running through March 18, 2017, “Phantom Punch” makes Bates one of the very few U.S. art museums, and the first in New England, to offer a major show of work by contemporary Saudi artists. One of four related exhibitions that have popped up across the nation this year, “Phantom Punch” presents work by leading and emerging Saudi artists in diverse media, from calligraphy to comedy, from painting to photography to video. Among exhibiting artists is Ahmed Mater, one of Saudi Arabia’s best-known artists. “Phantom Punch” hosted the U.S. debut of Mater’s video “Leaves Fall in All Seasons,” a look at how the holy city of Mecca is being transformed into an environment that favors the super-wealthy to the detriment of less affluent people. Njoud Alanbari, whose video and photographic works depict ubiquitous cultural messages directed at women. The name of the exhibition is a reference to both the knockout blow that boxer Muhammad Ali, a Muslim who became an American icon, used to win the World Heavyweight Championship over Sonny Liston in Lewiston in 1965; and, as Mills explains, the surprising nature of an art show made by residents of a country where censorship is pervasive and strictly enforced. The Bates show is the first group show of Saudi artists at a U.S. academic institution, and the first where the presenting institution led the curatorial work. In addition, Mills and Danforth have significantly expanded the number of artists receiving U.S. exposure, including women — nearly half the “Phantom Punch” artists are women. In a sense, the exhibition’s origin lies in a student visit to Danforth’s office five years ago. Leena Nasser, a junior politics major from Dhahran, Saudi Arabia, proposed that Danforth teach a course in and about Saudi Arabia for Bates’ springtime Short Term. Danforth was all for it. But he was a little surprised when Nasser suggested that the itinerary include Saudi art galleries. His own anthropological research hadn’t involved art. “I was initially unclear why those were on her schedule,” says Danforth, Charles A. Dana Professor of Anthropology. Clarity came quickly once Danforth had seen contemporary work by Saudi artists during that 2012 Short Term visit. “Seeing this stuff was amazing. It offered really interesting insights into Saudi politics and culture,” says Danforth, who dedicated a chapter on contemporary Saudi art in his book about the trip, “Crossing the Kingdom: Portraits of Saudi Arabia” (University of California Press, 2016). After the visit, Danforth approached Mills about the possibility of mounting an exhibition by Saudi artists at the college. Mills proved eager to co-curate such a show with Danforth. All four shows received support from the King Abdulaziz Center for World Culture in Saudi Arabia. Also partnering with Bates for “Phantom Punch” are Mater’s Pharan Studio and Gharem Studio, whose principal is Abdulnasser Gharem. Located in Lewiston, Maine, and engaged worldwide, Bates is broadly valued as a leading national college of the liberal arts and sciences, attracting 2,000 students from across the U.S. and around the world. Since 1855, Bates has been dedicated to the emancipating potential of the liberal arts and sciences, educating the whole person through creative and rigorous scholarship in a collaborative residential community. Bates has always admitted students without regard to gender, race, religion or national origin, boldly embracing the transformative power of difference, cultivating intellectual discovery and informed civic action, and preparing leaders sustained by a love of learning and a commitment to responsible stewardship of the wider world.